Pelican Beachfront - SPRING SALE 20% OFF!Family Friendly Paradise! Pelican Direct Beachfront Condo, Sleeps 6, 2 Bedrooms, Family Friendly! Welcome to Pelican Beach Resort vacation rental 513 in Destin, Florida. 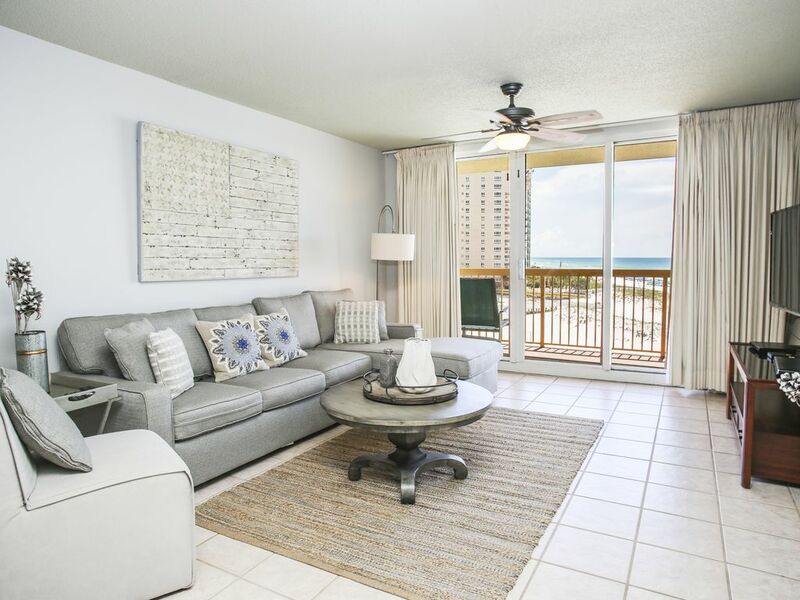 Pelican Beach Resort vacation rental 513 in Destin, FL is a 2 Bedroom 2 Bathroom direct beachfront condo. Enjoy fashionable and well appointed accommodations during your stay complete with all the conveniences of home. Experience breathtaking views of the beach & gulf from your patio daily; making it the perfect spot to call home during your beach vacation. Pelican Beach Resort in Destin, Florida has long been a family favorite. Pelican Beach Resort is a direct beachfront resort boasting incredible amenities offering something for everyone including several gulf view pools, tiki hut serving fun tropical drinks beach side, indoor/outdoor pool and more. The resort is centrally located in Destin, Fl and near many family friendly activities. Come and see why families come back to Pelican Beach Resort year after year for their beach vacation. Enjoy all of the fantastic Family Friendly Fun Destin, Florida has to offer on your next beach vacation! Enjoy! No matter how long you go to the beach, it is never enough! Panhandle Getaways offers over 450 vacation rentals along the Panhandle of Florida. Our vacation rentals in Destin, Fort Walton Beach, along 30A, and Panama City Beach, Florida provide the perfect vacation spot for your next vacation. Panhandle Getaways has been in business for more than 22 years and we offer a variety of property types which allows us to offer something for everyone. Pelican Beach Resort - Destin's favorite Family Friendly Paradise! Best bank for your buck with all of the amenities one seeks when looking for a beachfront vacation rental in Destin, Florida. Panhandle Getaways specialty is helping guests find the perfect vacation rental for them. Just do a general search online with the key words Panhandle Getaways in order to locate our direct contact information and book directly with us, plus it will save you a bit of money. We have been in business more than 22 years and Panhandle Getaways is a name you can trust. Pelican Beach Resort enjoys a central Destin, Florida location makes the property a highly sought after destination along with its fantastic amenities with something for everyone. Incredible beachfront property of Pelican Beach Resort in Destin, Florida is the perfect spot for your next family beach vacation! Pelican Beach Resort is a direct beach & gulf front resort with amazing views from each balcony! This resort is packed with amenities with something for everyone! Pools, Tiki Bar, Indoor Pool & more! Pelican Beach Resort is a direct beach & gulf front resort with amazing views from each balcony! While all towels are provided we encourage you to bring beach towels for use at the beach and pool. Very well equipped fitness center - free! Large flat screen in family room. Each bedroom has a flat screen TV. Balcony overlooks the pools, beach, and the beautiful Gulf of Mexico! Charters and rentals available via several boating companies in the area. Steam Room and Sauna here at Pelican Beach Resort with two Fitness Centers. (3) Three great pools here! Large pool with a waterfall overlooking the Gulf of Mexico, Heated Indoor Outdoor Pool, and another heated outdoor pool at the Terrace Building next door. Only thing that could have been better is a medium sized pot for cooking and a pan with higher sides for frying. We do a lot of cooking at home because of allergies . The unit was overall very good. The only complaint is the couch is not the most comfortable, and had limited pots and pans. The bed was comfortable. No other complaints. The view and the facilities are excellent. Room was spotless and clean! View was amazing!! We will be staying here again! Stayed there for a girls trip. The condo nicely decorated. very clean. scenic view, perfect location to all attractions. pictures did not do it justice. would love to stay again. The resort was very nice, the rooms were nice and the pool and beach were also nice. Although the resort was nice in itself the front desk assistance was not very friendly. When they saw we rented through VRBO they were not very friendly and really gave us little information as to what was available to us in the resort. Customer service could be looked into at every level. Nearly perfect, we loved the balcony, pools, beautiful beach, and good security on the grounds. Easy to get around town and easy garage parking. The water heater in our unit was so loud, and we didn’t have Any hangers which we were surprised by. The only other thing that would have been nice is an adult only hot tub. The hot tub was very small and always packed with little kids. We also didn’t think our place was very clean, when we pulled the sofa bd out the mattress pad was dirty and under the couch was garbage. Also, first two rows of beach are umbrella chair rentals only which was annoying because either you rent them or you don’t get a good view of the water. But, over all great stay! Big Kahuna Water Park across the street. Publix grocery store within walking distance. Golf Courses very close by. The Destin Airport is less than 5 miles away! Close to incredible shopping and dining. Family Fun in Destin is never far away with several miniature golf courses, bungee jumping and other exciting opportunities. Family Friendly Restaurants galore, shopping and fishing.